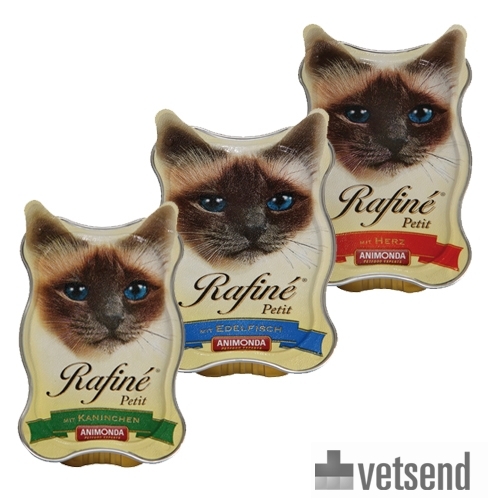 Animonda Rafiné Petit is a tasty pâté for cats in portion package of 85 g. Available in rabbit, heart or fish flavours. Animonda Rafiné Petit is a tasty pâté for cats in portion package of 85 g. Available in the rabbit, heart or fish flavours. Your cat will love this wet food from Animonda, as it is rich in important vitamins and minerals and contains no soy or artificial colourings and preservatives. It is a complete food with extra large pieces of meat or fish (salmon and monkfish). For adult cats that like high quality food. Animonda Rafiné Petit with rabbit: Meat and other animal derivatives (4% rabbit), oils and fats, minerals, vegetable products. Animonda Rafiné Petit with heart: Meat and other animal derivatives (5% heart), oils and fats, minerals, vegetable products. Animonda Rafiné Petit with fine fish: Meat and other animal derivatives, fish (4% salmon and monkfish) and fish products, oils and fats, minerals and vegetable products. Have you used Animonda Rafiné Petit before? Let us know what you think about this product.